Everyone who owns a WordPress site will experience an error or problem some point. It’s not question of if, but when. WordPress is probably the best blogging and content management system in the world, it’s definitely the most popular, but it isn’t without its problems from time to time. 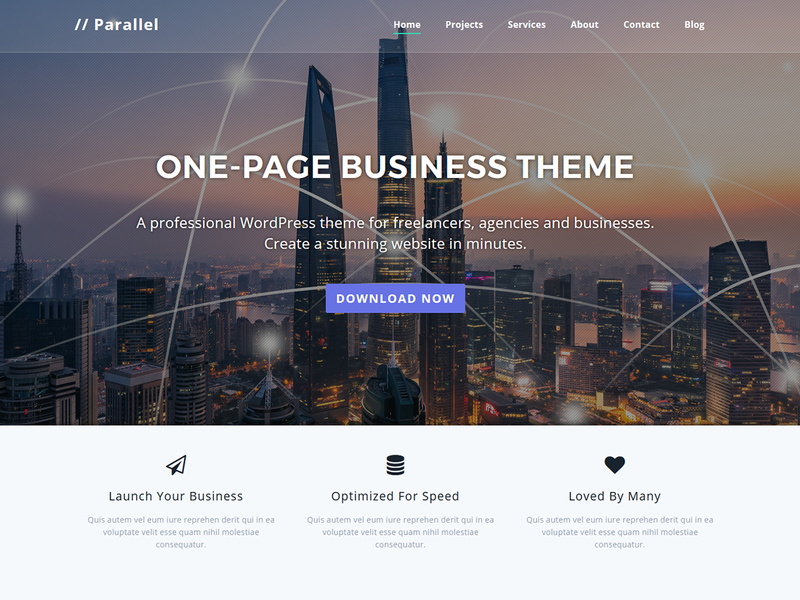 With each plugin or theme you install, you increase the complexity and chances of encountering an error which will break your site. For those of you who are beginners to WordPress this can be daunting and cause a lot of frustration. There are tons of troubleshooting & how-to guides online which explain how to solve specific issues. But what is really important, is knowing where & how to find them, and applying the knowledge to your specific WordPress problem. Two of the biggest & best resources I’ve used for 8+ years working with WordPress is the WordPress.org Support Forum and a site called Stack Overflow. I’ve used both countless times over the years and I’ve always managed to find a solution to my problem. 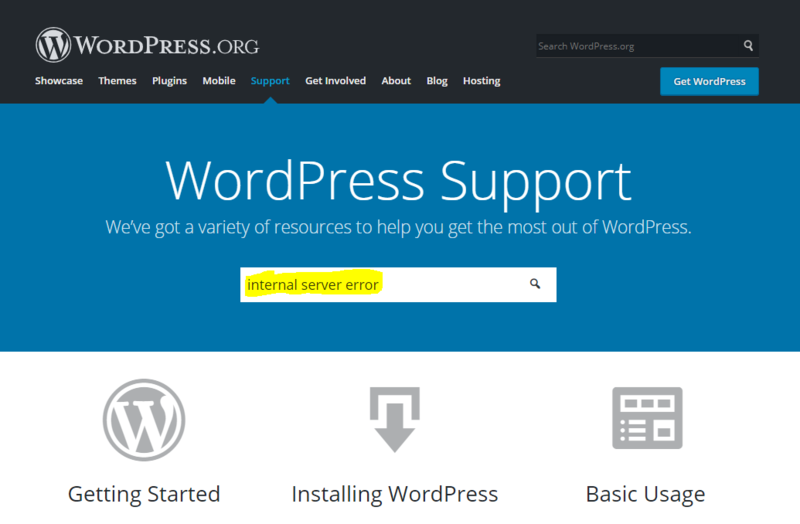 These resources are also great for beginners who may not be trying to troubleshoot an error, but are simply new to WordPress and have general questions about it’s use and functionality. In this tutorial I’ll explain what they are, how to use them and the method to getting answers to your questions. Essentially what I am doing is empowering you to find solutions, instead of relying on others. If you can master this skill, you’ll save yourself money, time and headache. The good news is that you’re probably not the first person to have encountered the problem you are experiencing. 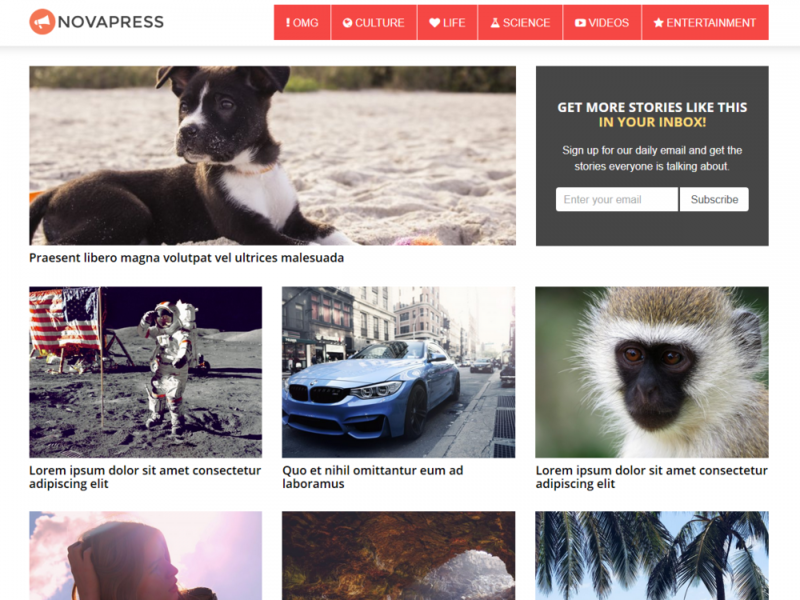 And because WordPress has such a strong community, most plugin and theme developers have profiles here, so you may be able to get answers from the developers who can give you the best answers. First, start by creating an account if you haven’t already by clicking the Register link at the top of the page. Otherwise, log in to your WordPress.org account. Once you’ve completed the registration process, log into your account and navigate to the WordPress.org Support Forum. Now, you’re ready to start debugging. But, let’s step back for a moment. If I’m to show you how to debug errors, we’re going to need a good example to use. Let’s use the example of an error most WordPress site owners will experience at some point. 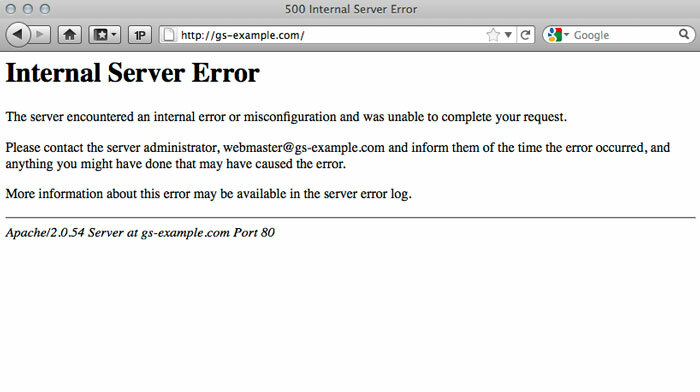 The 500 Internal server error. Usually this will occur when you’re trying to view your website after making a change or installing a new plugin or theme. It will look like this. Learning how to search correctly is important as it will present you with varied results. In this case I am going to simply use the name of the error as the keywords for my search. So i’ll enter following keywords in the search field. This search returned a total of 32,800 results. Don’t be alarmed, you won’t have to read them all 😉. The results display the most relevant responses. The good news is that you’re definitely not the first person to encounter this error. Start by clicking the first several results and read the replies. You can then attempt to apply the solutions suggested by other users. If a solution doesn’t work, simply click to the next response and attempt those solutions. And on, and on, until you resolve the problem. You have no idea how many times I’ve done this over the years. I have learned most of what I know today by using this exact method. It may be that none of the solutions you’ve tried work, in which case you can ask for help. 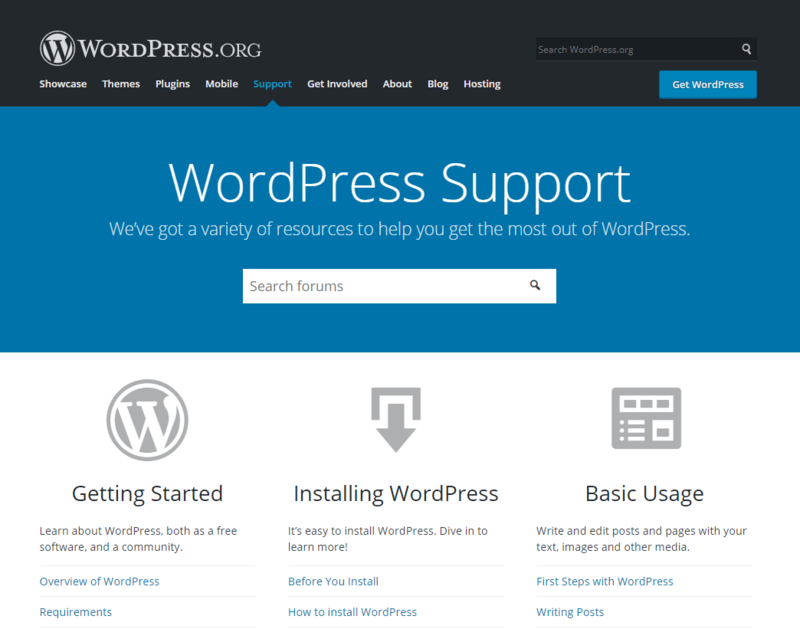 Asking for help from WordPress.org community can be quite helpful, since you can explain in detail the problems you’re experiencing, and get a tailored response. 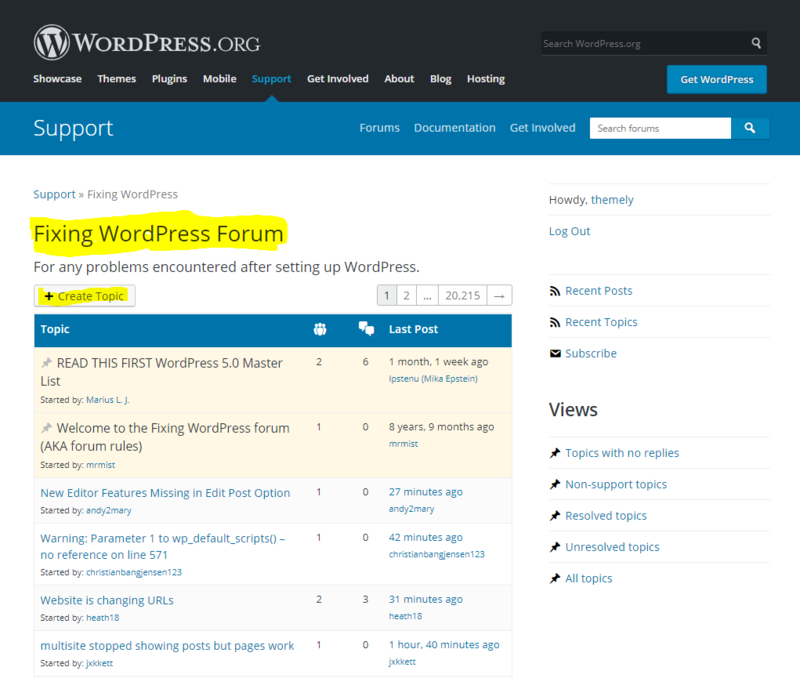 Make sure you’re logged in and navigate to the Fixing WordPress Forum. Click on the Create Topic button to ask a question. You’ll be presented with a few steps and instructions to get you started in the right direction. Fill out the form fields and provide as much information as possible. Often, users will only provide 1 or 2 sentences describing their problem without any context. You have to provide as much information as possible so users can understand, and replicate your problem. More information is better than not enough. Once you’re satisfied, click the Submit button. Stack Overflow is a massive online question and answer community for professional and enthusiast programmers. 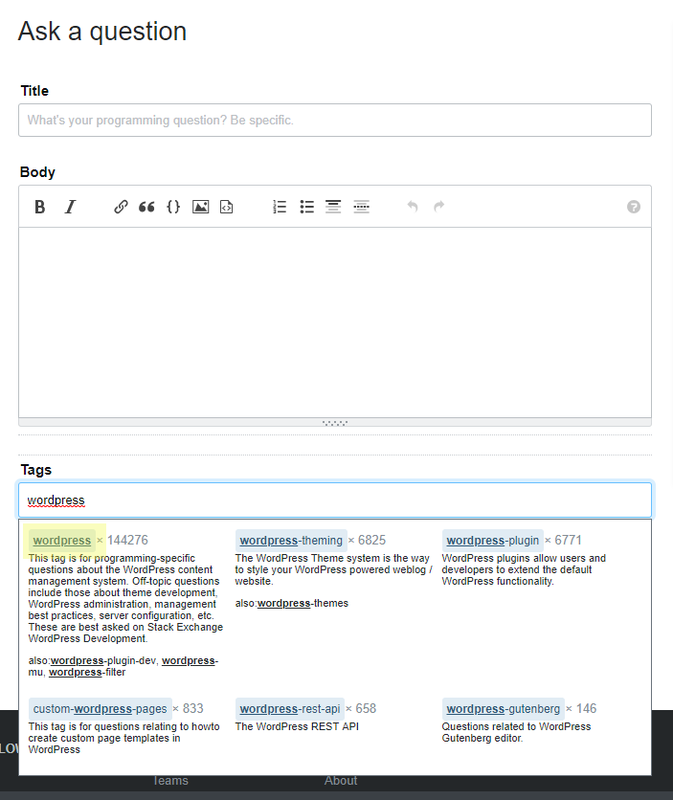 It’s built and run by users from around the world working together to build a library of detailed answers to every question about programming. 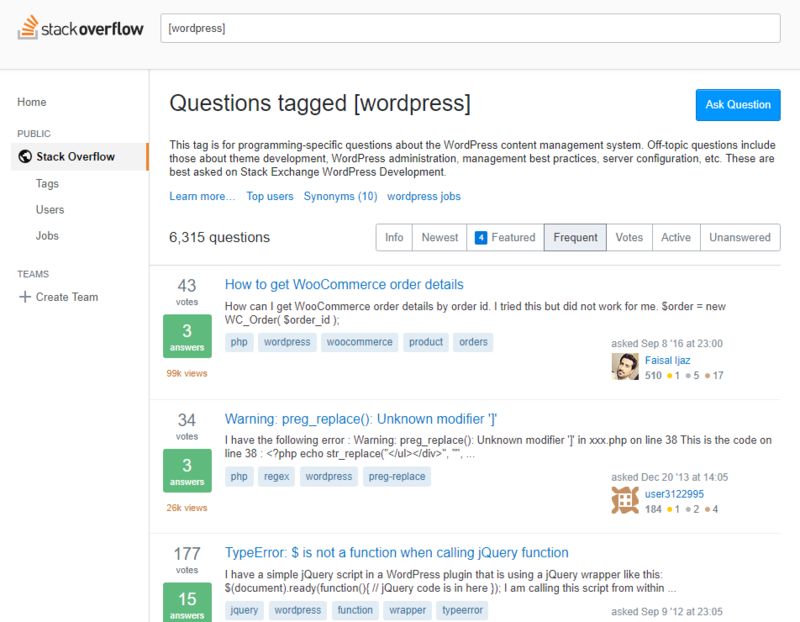 Stack Overflow is very similar to the WordPress.org Support Forums, as in you can search for answers and ask questions from fellow users. 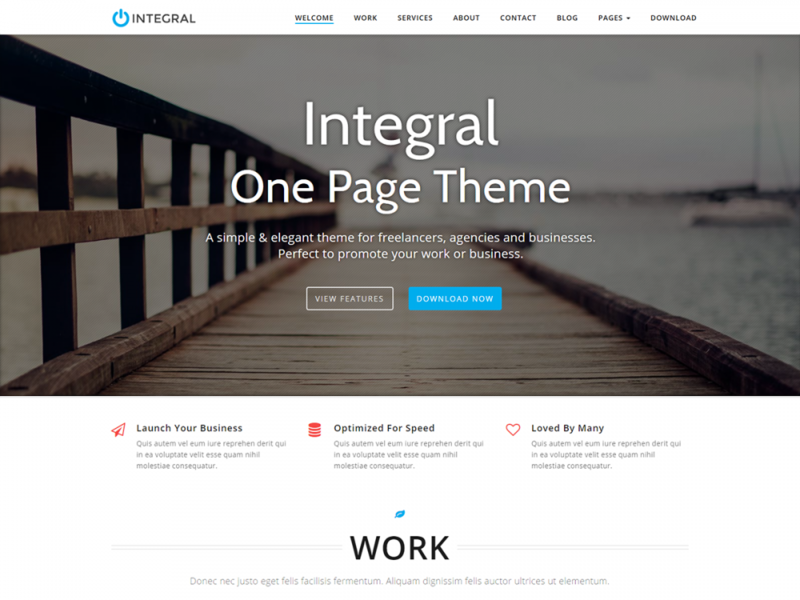 However, when searching you need to include the [wordpress] tag, which will return solutions specifically for WordPress. For our example, it will look like this. This search returned 500 results. One of the major advantages of Stack Overflow and main difference with the WordPress Support Forum, is its voting system. Voting is central to their model of providing quality questions and answers. It’s how good content rises to the top, incorrect content falls to the bottom and users who consistently provide useful answers accrue reputation and are granted more privileges on the site. So, their entire platform is built to help you find the best, most useful answers to your questions. It’s incredibly powerful. 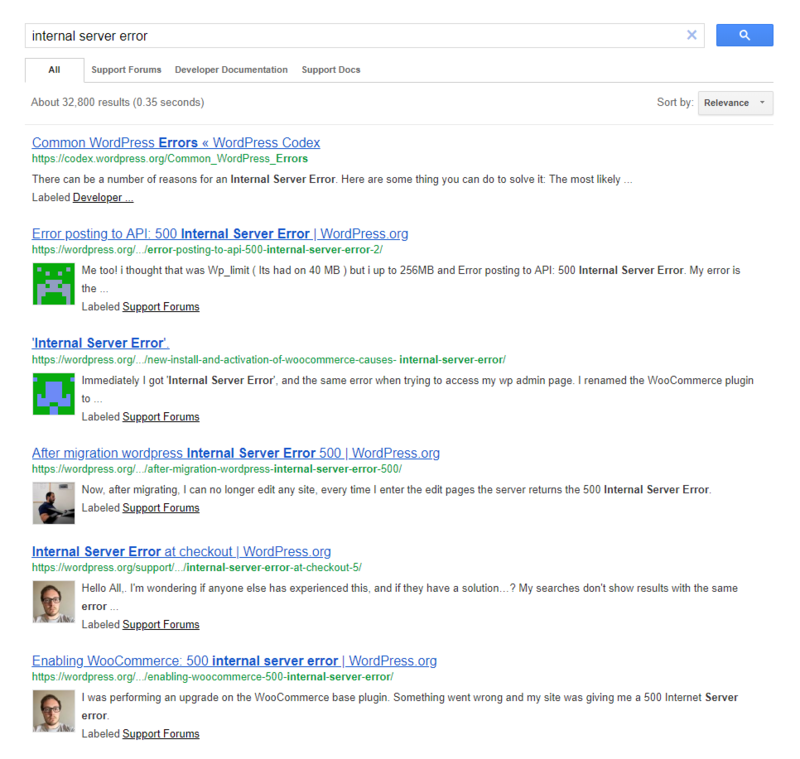 Similar to the method used in the WordPress.org Support Forum, click the first several results and read the answers. Try to apply the solutions suggested by other users. If a solution doesn’t work, simply click to the next response and attempt those solutions. Again, you have the option of asking a question if you’re unable to get help. Start by signing up if you don’t have an account, or log in. Once logged into your account, click the Ask Question button. When filling in the form to submit your question, be sure to select the WordPress tag. Make sure to provide as much information as possible to help fellow users respond to your question. The more information and context you provide, the better. And there you have it. 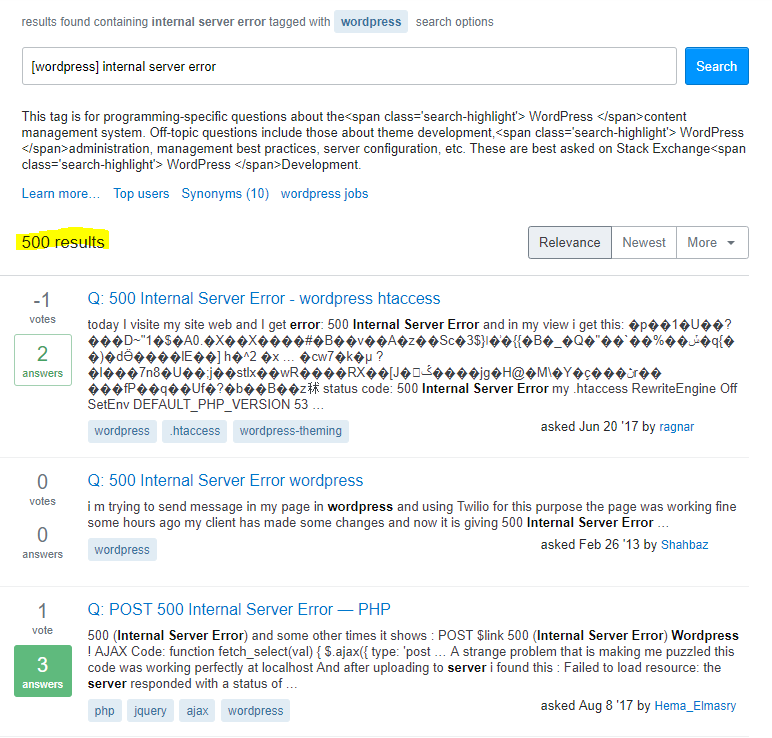 Two great resources and an invaluable skill which will empower you to troubleshoot errors and find solutions to almost any WordPress problem.